Activists allege that the government's actions in the area, including not letting anyone in, are undemocratic and an attempt to hide what happened. New Delhi: A group of civil society activists and organisations, who made an effort to meet farmers in Madhya Pradesh’s Mandsaur but were stopped by the police, have alleged that the situation in the region is “nightmarish” and one of “shocking anarchy”. The delegation that was trying to meet the farmers included Yogendra Yadav, Swami Agnivesh, Medha Patkar, Avik Saha and Kalpana Parulekar. However, they were stopped in Ratlam and no one was allowed to go further. Talking to The Wire Hindi at a press conference in Delhi, Yadav said this was completely undemocratic and unconstitutional, and an attempt by the government to hide what had actually happened. 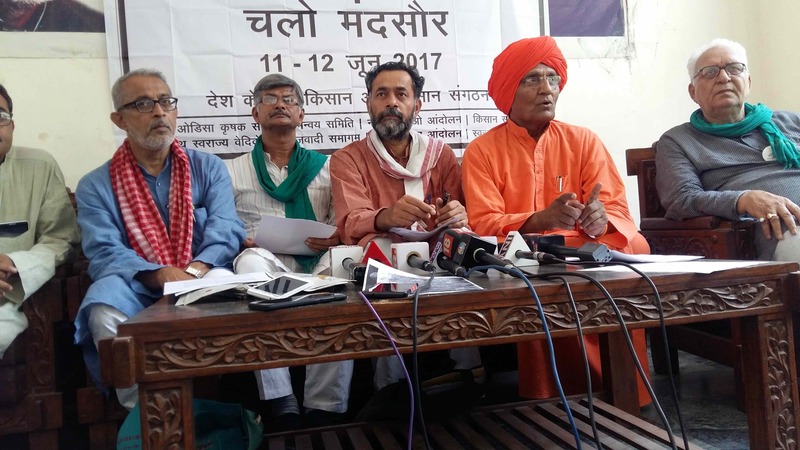 In a statement released after their visit, a group of NGOs including Swaraj Abhiyan, the National Alliance of People’s Movements, Bandhua Mukti Morcha and several farmers’ organisations have said that the police and administrative authorities in Ratlam district have created an illegal surveillance system in the Mandsaur area, stopping anyone who wants to meet farmers and detaining activists by falsely accusing them of ‘breach of peace’. Even in areas where there has been no agitation, such as the Neemuch district, activists were not allowed to speak freely to farmers and brute force was used to make them leave, the organisations have alleged. According to the farmers they did manage to speak to, the organisations have said, there has been a complete law and order breakdown in the area and everyone is living in fear. Districts that were the epicentres of the farmers’ strike have now been completely cordoned off, they added, and “jungle law” has been implemented. What is even more disheartening, the activists say, is that the deep-rooted livelihood issues faced by farmers continue to be ignored, even after the large-scale protests. Despite Madhya Pradesh having very high agricultural productivity, something that has been praised by the Centre, farmers are running losses because of the low prices of produce. Despite the BJP’s election-time promise of raising farm incomes to 50% above cost of production, incomes have remained stagnant and even slowed down after demonetisation, the activists have said. Two consecutive droughts have been very expensive for farmers, and when they finally came out of it they were faced with low prices and high loans. In addition to this, the statement quotes local reports which say that extremely bureaucratic mandis and other looming threats, like compulsory registration of seller-farmers only through Aadhar and 50% payment through banks for government procurement, have added to farmers’ woes. After all of this, instead of listening to farmers and coming up with a solution, the government has responded with force, the activists allege. “Since the state has already admitted that firing was done without any formal order and without following due process, the death of farmers in police firing is nothing but murder by machinery of state,” the statement says. “The heinous and brutal killing of a farmer by beating and torture in the hands of police, after the gunning down of five farmers, is unbelievably shocking and can only be termed state-sponsored terrorism.” A dialogue with farmers could easily have prevented this bloodshed, according to the civil society groups. Saying that activists will continue to try and reach Mandsaur to meet the farmers, Yadav told The Wire Hindi that civil society organisations are organising a farmers’ mahapanchayat in Madhya Pradesh on July 6, exactly one month after the shooting that killed five farmers. While the administration had initially said that the bullets were not fired by the police, they later admitted that they were. The mahapanchayat will discuss how to increase profits for farmers, engage in loan-free farming and related issues.